I am really pleased to say that the Tarot project that Tom de Freston and I have been working on for a couple of years has come into fruition! 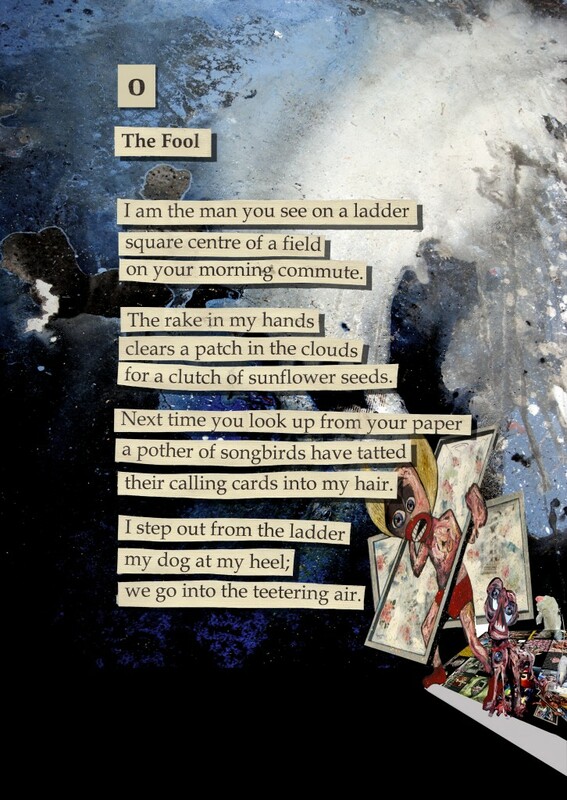 We have called it Fool’s World, which seemed appropriate, given the narrative of the major arcana begins with The Fool, and ends with The World. If the Fool is lucky enough to have come out the other side of his journey, he will attain the World. In our discussions about how to make the pack into a physical object, we decided to focus solely on the Major Arcana cards, which are traditionally the most significant and represent the large turning points in life. They are also the most universally recognised outside of the Tarot-reading world. There are many spreads that can be done with the Major Arcana, so we hope that the cards will be useful to work with. Practicalities came to the fore, such as the size of the cards and therefore the legibility of the font. We also didn’t want Tom’s powerful visuals to shout over the poems. Nor did we want the poems to have dominion of the cards, allowing Tom no space to play in. For this reason we lighted upon the notion of a set of visual cards and a set of poems cards, with each taking prominence respectively. I feel very lucky that Tom wanted to work on this collaboration, and we both feel blessed that Gatehouse Press would want to publish something more challenging than a book. They worked incredibly hard to produce something gorgeous.